From passion stems compassion and then the desperate need to help out the tiny paws… life is not that simple for an animal shelter volunteer. Let’s see why. The word ‘volunteer’, according to Oxford Dictionary, means ‘a person who offers to do something without being compelled or paid’. Ordinarily, I would accept most meanings they come up with, but this one I have to mark as incorrect, most certainly with regard to the team of volunteers at the SPCA Animal Shelter in Noida. They go there because they are ‘compelled’ by a desperate need to help out, to give love and care, to somehow make a difference, to bring some joy into the lives of these ‘children of a lesser God’. They have limited medical knowledge, but they carry with them unlimited love and care. That makes up for a lot, as good intentions always do. And they do get ‘paid’… paid in pure love and total devotion. Volunteering was just a vague idea in our minds when we started. We all had some free time, the idea was to go and help out the tailwaggers. We decided to start by helping out in the Puppies and Paralysed Dogs section in the animal shelter. This section also houses the abandoned pure breeds – all of them are heartbroken and need a lot of love and care. We also realised that coming in our free time would mean nothing. We needed to be here every day, free time would have to be created. It was a commitment we had made. Puppies are fragile. Maimed, ill, hurt puppies are doubly so and we decided to serve them a snack of Cerelac every afternoon to give them a boost. Feeding bottles were bought and we were on a roll. The tiny babies were bottle fed; the older pups lapped it up from the feeding bowls. We even made a makeshift puppy pen out of old wire netting to segregate them. Was all well? No. The older, paralysed dogs in the section watched us and waited for their turn to come. So, we added bread and eggs to the mixture after the puppies were fed and started to serve our paralysed adults too. They lapped it up and we thought we were set. Wrong again. The seemingly ‘healthier’ dogs, those who had healed somewhat from their injuries, now started to watch our every move with the fiercest of concentration. How could they be ignored? It is impossible not to get affected by melting eyes, showing deceptive hunger. So, we started to feed them too. But it didn’t end there. Some of our pups caught secondary infections like colds and congestion and were moved to another room meant for this purpose. We fretted for our babies and followed them there to give them the snack they were used to. Here we were met with more candidates who had mastered the ‘melting the heart hungry look’. So, we started to feed them too. We also discovered another room where injured puppies were kept. They deserved the snack too. They came under our fold as well. It didn’t stop at that. How could it? We couldn’t just offer them food and leave. We coaxed the fussy ones to eat, we tried to control the greedy ones, we consoled the ones who were hurting and we rejoiced when we saw some recover in front of our eyes. We removed ticks, held them during their treatments, bathed them, brushed them, played with them, and loved them. We were getting very attached to them. Every baby we lost devastated us. It was a struggle not to get derailed by these losses. We felt as if we had let them down, not done enough. We comforted each other; we were comforted by those remaining and all those who were brought in everyday. We forged new attachments, we couldn’t think of leaving. The enormity of the work to be done in a shelter hits us very often. It is never ending. And we have become experts at multi-tasking. No one has time to ask questions or wait for answers. Whoever reaches first starts getting the food ready. The volunteer next in gets the bowls organised. Together they run the kitchen. An area needs cleaning, pick up the broom. A shed needs washing, someone fixes the pipe, another gets to work with the wiper. A paralysed baby needs turning, just do it. Feeding bowls need washing, squat near the water spout and get it done. Water bowls need filling, just do it. Fights break out; dive right in and save the weaker ones. P.S. Try and not get hurt while at it. The team is bound together by its love and commitment to the babies. Our goals are the same, our hopes and nightmares are the same as well. We aim to provide palliative care, to give comfort and hope. The volunteers are guided and supported by the management, the shelter head, the para-vets and the various department heads. We do very little as compared to them, but we believe every bit counts. We see the babies blossom under our love, develop personalities, show attitude, throw tantrums and we know we are doing something right. Their welcoming faces and unconditional love make it all worthwhile. (Pallavi Dar is a volunteer at SPCA Noida. Set up on the land leased by Noida Authority, SPCA Noida caters to the needs of abandoned, sick, injured animals. For details, log on to:www.facebook.com/pages/Society-to-Prevent-Cruelty-on-Animals-at-Noida). Let’s join hands…for a noble cause! Compassion for animals is the noblest of all virtues…and serving these mute creatures is the biggest charity…this might be just a thought for us but for C Padmavathi and C Narasimhamoorthy, who run Animal Welfare and Protection Trust (AWPT) at Santhoshapuram in Tambaram, it is an every day reality. In 1999 the Chennai Municipality began killing stray dogs by immersing them in acid baths. On witnessing one such brutal killing, C Padmavathi and her husband C Narsimhamoorthy opened their home and hearts to these dogs. Thus, ‘The Animal Welfare and Protection Trust’ (AWPT) was born. Together with other NGOs, they asked the municipality to stop killing strays on the promise that they would sterilize them to reduce numbers. The municipality agreed… and this elderly couple willingly poured their life’s savings for the cause and dedicated their concluding years of life to their compassion. Today they house over 200 dogs and 30 cats, most of whom are permanent members as they are too ill to be relocated. These include dogs with tumors, handicapped dogs and even a few new born pups. Over the years, the couple had helped many abandoned dogs find homes, looked after injured ones and sterilized a number of females. With their minimal earnings and savings, the couple is running the organization. But, today, they are facing real tough times. The AWPT’s monthly expenses are around Rs 60,000 which includes the cost of food, medicines, surgeries conducted etc. The trust has three doctors and three paramedical staff, there is always a vet on duty, through the night for emergency cases. They also have two ambulances for the purpose. At present the NGO operates from the couple’s own house and a rented building which serves as a pet clinic and houses dogs and puppies but is facing problems due to lack of funds and space. Their rescued animals include cats, dogs, birds, monkeys, rabbits, and even snakes and wild jackal rescued from nomadic gypsies. They had to shift clinic thrice as people did not take kindly to the presence of so many dogs in their area. They have appealed to the Government many times as to their immediate need for more space but the response has been apathetic. The Government had promised them a one-acre piece of land in 2002, on the recommendation of Menaka Gandhi but the land is still awaiting sanction at the Kancheepuram Collectorate. Over 70 years old, the elderly couple is still full of life and aspirations and have a strong will to serve these animals till the end. Padmavathi is highly worried about the future of her animals, the stress she faces everyday of not knowing what will happen to these animals once she’s gone. They need money to buy land to build a permanent shelter and clinic for these dogs. Or else the dogs will become homeless again, back to a life on the street or a brutal death. The truth is that most of them are not in a state to survive on their own. So either way, they won’t make it. “We appeal to animal lovers and philanthropists to help us with liberal donations to help a noble cause. Our motto is “Compassion for animals is the noblest of all virtues”. If each house or family can feed a stray animal every day there will not be any famished animal on the roads. All donations to the trust are exempt from Income Tax under section 80G,” concludes Padmavathi. For help contact : The Animal Welfare and Protection Trust: No 3/140, Kalaignar Karunanidhi Street, Santhoshapuram, Velachery – Tambaram Main Road, or call: 22781381/ 98416 38489/ 98412 48870 or email : awptrust@yahoo.com. http://www.dogsandpupsmagazine.com/wp-content/uploads/2017/05/1254nal.jpg 0 0 Dogs and pups Magazine http://www.dogsandpupsmagazine.com/wp-content/uploads/2017/05/1254nal.jpg Dogs and pups Magazine2013-09-05 10:51:292014-02-07 17:47:30Let’s join hands...for a noble cause! The Indian law protects our four-legged companions! Earlier in 2008, a similar order came from a lower court that clarified that pets are part of family and cannot be restricted from living or using the residential complexes. In 2012, Gurgaon Municipal Corporation was the first of its kind to issue strict notices to all central government health scheme (CGHS) and residence welfare associations (RWAs) in Gurgaon, warning them not to formulate rules and regulations against pets and that any such move is in conflict with the law. The notices clearly stated – ‘Such a move may lead to dissolution of the RWA and prosecution of its office bearers, says the letter. It is illegal to remove animals from the area through security guards employed by RWAs. Nor can they intimidate residents who may be feeding those animals. Under stray dog management rules 2001, it’s illegal for an individual, RWA or estate management to remove or relocate dogs. The dogs have to be sterilised and vaccinated and returned to the same area. Vaccinated and sterilised dogs cannot be removed by the municipality too. Under Section 506 of the IPC, it’s a crime to threaten, abuse or harass neighbours who feed animals.’ The Indian Constitution states them very clearly via various Sections. After the Stockholm Declaration in 1972 the Indian Constitution (Forty-second Amendment) Act, 1976 inserted for the first time specific provisions to protect and improve the environment. Article 19 deals with the fundamental rights of the citizen. So, ‘Right to Protect the Environment,’ comes within Article 19. Article 25, 26, 27, 28 provide religious freedom to all citizens and preserves the principle of secularism in India. According to the constitution, all religions are equal before the State. Citizens are free to preach, practice and propagate any religion of their choice in their own way. Feeding animals like dogs is a part of the same in many religions. The Animal Birth Control (Dog) Rules, 2001, enacted under the Prevention of Cruelty to Animals Act, provides for sterilisation and vaccination as a means of stabilising/reducing stray dog populations and eliminating the risk of rabies; and prohibits relocation of stray dogs, i.e. throwing or driving them out of one area, into another. Under Stray Dog Management Rules, 2001, it’s illegal for an individual, RWA or estate management to remove or relocate dogs. The dogs have to be sterilised and vaccinated and returned to the same area. Vaccinated and sterilised dogs cannot be removed by the municipality too. Under Section 506 of the IPC, it’s a crime to threaten, abuse or harass neighbours who feed animals. IPC Section 428 and 429 provide severe punishment (up to five years imprisonment) to people resorting to dislocation, abduction and acts of cruelty towards community animals or pets. Delhi Police Act 1968, Sections 73 to 79, 99 give special powers to police to take action when an animal offence has been committed. Ministry of Public Grievances notification and a similar notification by Animal Welfare Board of India dated March 2008 provide immunity to animal feeders and restrict government employees or bodies such as Resident Welfare Associations from harassing people who try to feed or help animals. The Environment (Protection) Act, 1986 and Wildlife (Protection) Act, 1972 at various places protect the stray dogs against any kind of cruelty. Directive of the Central Mumbai Consumer Disputes Redress Forum, given on 22/11/10 came down strongly against the housing societies who were charging a resident for use of lift since October 2008 for pets. High Court of Delhi in 2011 passed an order asking the police to provide protection to dogs and dog feeders and has made it a punishable offence in case anyone restricts, prohibits or causes inconvenience to any person feeding a street dog or resorts to removal, dislocation or killing of a dog. The Supreme Court of India in 2009 gave a similar stay order against removal, culling or dislocation of a dog anywhere in India. Semi-adoption of street dogs by RWAs, commercial and institutional establishments. By adopting, RWAs are limiting the number of dogs as these dogs won’t let other dogs come into their areas. Dogs guard from dogs. Immigration of feral and biting dogs will be automatically checked by these community dogs. Contacting local NGO/AWO for ABC AR (Animal Birth Control and Anti-Rabies) of these dogs and ensures they are brought back into the same area. By vaccination and sterilisation, the RWAs can make sure the dog bites, aggression at time of mating season and that by lactating female dogs is reduced. Plus these rabies-free dogs would provide protection from other rabid dogs. Their population will not increase for at least 8-10 years, which will give NGOs enough time to do the ABC AR programme in the entire city. Regular feeding will domesticate these dogs to the level that they would protect humans from any threat and within neighbourhood bites will become zero. Humans become the primary food source who the dog would guard and protect, unlike a case when the dogs will protect the garbage dump from the humans. (Rishi Dev is founder of Citizens For Animals Rights (CFAR), Dwarka, New Delhi). http://www.dogsandpupsmagazine.com/wp-content/uploads/2017/05/1254nal.jpg 0 0 Dogs and pups Magazine http://www.dogsandpupsmagazine.com/wp-content/uploads/2017/05/1254nal.jpg Dogs and pups Magazine2013-05-18 15:47:052014-02-07 17:47:30Say No to animal abuse! She is a school teacher, she is an animal lover, she is a pet parent and she believes in each act of kindness! Here the mention is Annu Gujral who inculcates giving, caring, compassion in children for the welfare of stay dogs in Delhi. Catch a glance of her benevolent acts! In her mission to shelter and feed stray dogs, Annu Gujral has been into charitable activities in which her students at RS Junior Modern School, Humayun Road, New Delhi involve wholeheartedly to uplift the lives of those underprivileged pooches. Annu said, “We call it ‘Pet Club’ under which students contribute a packet of rice, dahlia, newspapers or meager amount of money to deliver on 10th of every month to the welfare of strays through Friendicos SECA (Defence Colony) – a non-profit charity, which is an Associate Society of RSPCA and a Member Society of World Society For Protection of Animal, UK.” Geeta Seshamani, co-founder & vice-president, Friendicos SECA, New Delhi remarked that Annu’s effort is not just a matter of giving foods to the strays, she teaches school children and young generation the values of loving and caring animals. Students of fifth standard take the responsibility to collect the donations from other classes at the school. “We select one captain amongst the Pet Club members from other classes and one from every section of the fifth standard – being the senior most class in the school. We can easily collect around 400 kg of newspapers, 150 kg of rice and dahlia every month,” said Annu. Pet Club started around 15 years back – it motivates children to donate and in return to support Friendicos SECA in their endeavour. The children also give a part of their pocket money to support the cause. Some children donate enthusiastically and bring in their pet’s items also. Annu mentioned that it has been the support of her school headmistress Mrs Manju Rajput which makes the mission a success. And if Annu is little strict in class, an adoring student always has her pet’s picture to show Annu and makes her smile. Annu with her mother Dr Vimla boast of a ‘family tree’ of pets. In the company of a group of adorable pooches are other pets like fishes and birds who contribute to form a perfect pet world. Ever since her younger years, Annu always had special affection for pets. “Around 40 years back, I collected my daily pocket money of 40 paise to purchase a white mouse worth Rs 8 as my pet,” remembered Annu. Today, those furry family members roaming around her include a couple of Chihuahuas named Zara (mother) and Pisti (daughter), a pug called Miffy, a Spaniel Cocker named Kiwi… to mention some of them. “What it really upsets me is the unsafe lives of stray dogs in various localities around the city. Many of them die in hit and run road accidents. Sterilisation is also one big challenge. Here I have noticed that each act matters,” said Annu. Annu recalls her Irish Setter called Timber who once crept silently to gorge on a two-kg birthday cake. Worry over the incident was that it might have given him stomach upset! But Timber enjoyed the cake without any complication. A peek into the life of strays and how we can help them. We have to understand the fact that we have to co-exist with stray dogs and hence it’s better for us to adopt the policy of ‘Live and Let Live’. With this background in mind, befriending stray dogs who live around our houses is the way to go. Since dogs are known for their loyalty and faithfulness, one can say with almost 100 percent confidence that the dogs who have befriended would only protect the people with their heart and soul, says Vasanthi Kumar, of STRAW (Stray Relief and Animal Welfare), New Delhi. “And she’s right. Four cooperative group housing societies in Sector 10, Dwarka, New Delhi are blessed with two street dogs, Dolly and Chotu. Both of these dogs have lived outside these four apartments for almost eight years now, making them the only two dogs in a human population of 2000. Initially there were only a handful of people feeding these dogs and taking regular care of them. But now, everyone feeds them and takes care of them – because they are the heroes – who have saved us from chain snatchers, thieves and other miscreants. Dolly and Chotu are often seen chasing rats, snakes, monitor lizards and so on,” adds Rishi Dev of Citizens For Animals Rights (CFAR), New Delhi. “Each act of kindness works,” says Debbie of Precious Paws Foundations, Bengaluru. “Street dogs require only our tolerance and respect. It is not their fault that they are on the street. But now that they are, it is their home. We must respect a dog’s territory. If you are afraid of dogs, then please leave them alone. Do not throw stones at them, do not hurt them, and do not scream in front of them. Screaming, reacting with a jolt, running away only draw their attention, and dogs think of these actions as a game as best. At worst, you would be instilling fear in them and they may become aggressive. If you are dog friendly, then please go ahead and feed dogs in your area. You will find that they reciprocate most lovingly; they will come to you with their tails wagging. If you find a dog hurt on the road, call an ambulance. If there is no proper ambulance service in your area, first tie the dog’s snout before proceeding to pick him up and taking him to the nearest vet”, adds Debbie. “Just feed the dog, may be even a few biscuits daily, for 4 to 5 days and he would start recognising you, waging his tail and over a period of 2-3 days, would also become one’s friend. After befriending the stray dog, his vaccination and sterilisation programme could be arranged through an NGO and he could live as a community dog for the rest of his life under the care of the people in that colony,” tells Vasanthi. “The most common diseases found in rescued Indian pup/dogs are fleas, heartworms, parvo, distemper, ear mites, throat worms and mange,” lists Debbie. When a pup or dog is rescued, it is very difficult to determine if he contains any diseases just by looking at him unless the symptoms are visible. The best way to determine if he has any diseases is to take him to a vet for a checkup. A street dog can be fed anything that you feed your pet. “Biscuits, bread and buns are commonly used,” adds Debbie. “My request to people is not to throw their leftover foods into the garbage bin. But instead it should be fed to stray dogs. People should also put out a bowl of water outside their houses for stray dogs. A mud bowl is ideal because it keeps the water cool besides it does not get stolen,” adds Vasanthi as a matter of fact. Sometimes, even feeding dogs become a problem… neighbours often ask to stop feeding strays. 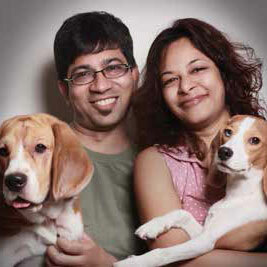 Kishore Deshpande and his wife in Mumbai were threatened by their neighbours to stop feeding strays. This is just one case… there are hundreds more. Following a petition from stray dog lovers in Delhi, the Delhi High Court had ordered creation of designated area for feeding and caring stray dogs in all colonies, which was a much-needed relief for all dog lovers. Benefits of having stray dogs…. Here are a few benefits that Vasanthi lists for having stray dogs around. Stray dogs make the colony safer. They do not allow strangers to enter the colony and alert the guards by barking. At nights when the guards are patrolling the colony, the stray dogs accompany them. If one talks to the guards, they would learn that the guards feel much safer with dogs because they are able to go after unscrupulous elements who could be hiding behind trees and cars. Since the stray dogs feed from the garbage, they keep rats and mice away. Since dogs are territorial animals they will not allow any other dogs to enter the colony. If the dogs are removed from an area, other dogs from surrounding colonies will take their place. Thus we will be back to initial situation within a few months. Above all, all life is precious and all creatures including dogs have a right to live on this earth. “Be kind and compassionate to animals whom we come across in our day to day lives. Animals have feelings; feel pain when hurt and bleed when injured – just like it happens to us. The only difference is that unlike us, they do not have a voice and bear all the pain, in quiet. Instead of getting scared of a stray dog, people should try and befriend the animal. And lastly, if possible feed at least one stray dog near one’s house. To show his loyalty, the dog would sleep outside your door and safeguard your house with all his might,” advises Vasanthi. “Precious Paws Foundation would like to emphasise that every contribution, small or big, counts. Go make a difference in a pup’s life, one way or another,” concludes Debbie. One day I saw a female dog running with a pup carrying in her mouth in the month of July. I was surprised to notice that she was our colony dog who gave birth to three pups recently. I named the mother dog Bhuraki. One day she came to me when I called her name and carried her little one to handover to me. I cuddled the pup and took him inside the house. After an hour, the mother dog barked furiously as her second pup fell into a drain. I rescued the little one. Since that day, they all lived with me. I sterilised the mother. This is indeed a happy beginning! Gori was her name! She was a Pomeranian abandoned by her pet parents. She delivered two litters in front of me. A total of nine dogs I adopted. I fed them twice a day, which included a Pedigree meal. They looked after our huge campus. Today, only two live! I have nick-named them Chingu and Mingu, they are just unique. I have semi-adopted a stray and named him Tilli. He is my pet’s best friend and they both love to play together. Whenever he meets me, he always greets me wagging his tail with a smiling face. “The one absolutely unselfish friend that man can have in this selfish world, the one that never deserts him, the one that never proves food to offer; he will lick the wounds and sores that come in encounter with the roughness of the world…When all other friends desert, he remains,” -George G Vest. Then, why does man desert this precious being… sometimes due to behavioural issues, sometimes because he is sick and sometimes just the frenzy of keeping a pet is over. Loco, a Bull Terrier, was found on the roads in Dwarka almost four months back by Friendicoes. He was adopted but it did not work out because of his high level of energy which led to his causing huge damage at his new home. While, Oscar was a gift to someone as a puppy but later he permanently made his way to a boarding kennel when the family could not handle him anymore. At the kennel he viciously attacked one of the kennel boys and the pet parent too scared to handle him, left him at the shelter. Valentine was found on the road – a blind St Bernard standing by the side of a busy road. He lived at the shelter for a week, a month in foster care and then we found a lovely couple willing to take him on. He is now a show stopper weighing a whopping 70 kg and handsome to boot! But initially the only inquiries we got for him were people asking if we can fix his eyes and the moment we said ‘no’, they lost interest. A blind St Bernard was not so appealing apparently. Jill was found dragging her hind legs and trying to cross the road in front of Friendicoes shelter. Her one back leg is mangled – looked like an old injury healed all wrong. And that gave her body a humped posture. No one asked for her but she was adopted by a loving family, who loved her despite her handicap. Leo, a Doberman of considerable height and girth, turned up at the shelter doorstep one day. He was unpredictable at times and gave the staff a bit of a difficult time. He was trained and finally after rehoming him twice, he found his perfect home. These are just a few cases, there are many many more of abandoned Pedigree dogs, while some are lucky to be re-homed, others just live their life at the animal shelter. Why are pets abandoned? What can be done to reduce this menace? What responsibilities should a pet parent understand? These were just a few of the questions that arise in our minds. At Dogs & Pups, we spoke to Tandrali Kuli of Friendicoes and here’s what she shared on abandonment of Pedigree dogs. D&P: How often and where do you find abandoned Pedigree dogs? Tandrali: Most times they are abandoned outside the shelter – left tied to chairs/benches, ambulance bumpers in the parking or on the road, running in front of the shelter. While some cases of abandoned pets are reported by the public from housing colonies, who are then picked up by our ambulances. A few people come and abandon directly as well. D&P: What are the main reasons for their abandonment? Tandrali: Mostly because they are either old/sick or temperamentally unpredictable/aggressive. But these days we are receiving a lot of them due to people moving cities and also because the lifestyle does not make space for a pet any more. Also sometimes people are not ready to shell out the money and time needed to look after a giant breed. D&P: What are the steps to reduce the cases of abandonment? Tandrali: We can reduce it by licensed breeding and putting a constraint on commercialisation of pets. Also microchipping of pets should be made compulsory and registration of pets with veterinarians be made mandatory. No vet should attend to un-microchipped and unregistered pet above the age of three months. Besides, hobby breeding should be strictly stopped. Also (my personal belief though may not be practical) is that every person looking forward to adding a pet to the family must attend counseling sessions (that should be organised by animal welfare groups) and understand the massive responsibility they are taking on and also understand the breed they are going for. Many times, people living in a two room (150 sq ft) house bring home a Great Dane without a second thought and then once the animal attains his size, they are unable to handle him. Also the earning power of the family should be taken into consideration when taking on a pet. Pets are living beings and incur expenses. Vaccinations, nutritious food, supplements, shampoos, medical bills are all things that should be taken into consideration. As an NGO, we face the maximum of these cases where people with high maintenance pedigrees beg us for discounts on medical bills. D&P: What factors should pet parents keep in mind before adopting a dog? Lifestyle. People who travel too much and have no dependable back up help should not take on pets. Money. If you cannot afford a pet you should not go for one. Commitment. If you as well as your family are not 100 percent sure about a pet then you should not get one. At the end of the day they need a lot of care and attention. Do not take vaccinations lightly. Please be prompt with them. Spay/neuter your pet once he is over eight months old. Responsibility. If you are in a job where you do not have quality time for your pet then you should not invest in one. No servant, however good, can equate to the care you can and should give to your pet. Your pet also has emotional needs apart from food and vetcare and he looks to you to fulfill them. Breed. If you are not experienced with dogs then you should always go for a smaller low maintenance breed or preferably an Indian/desi from a shelter. Also a female would be easier to handle than a male as they are much more calm and gentle. Trainer. It is always good to invest in an experienced and intelligent trainer. If you follow the rules, you will never regret it. D&P: How easy/difficult it is to rehabilitate the abandoned dog and why? Tandrali: Pedigree adults still have a 50 percent chance of getting re-homed with a good family. But the younger, the better. The ones above five years old hardly get any responses. We currently have nine of them at the shelter – three GSDs and six Labs between 7-9 years. The smaller breeds get adopted quicker (except for Spitz) butthey are rarely abandoned until and unless they are sick or are bad biters. Compared to it, abandoned Indian/desi adults arealmost impossible to re-home. Almost 99 percent of them make their way to our sanctuary in Gurgaon as we do not get any inquiries for them. D&P: What message would you like to give to pet parents? Tandrali: DO NOT take on a pet if you are not ready to shell out the time, commitment, effort and money that the pet will demand. And if possible try and adopt. Do not buy. You provide a market to unscrupulous breeders when you buy. There are enough homeless animals languishing in shelters and looking for good homes. Give them a chance please. If you want a pet but are in no position to meet the demands of one, start feeding the neighborhood strays and make friends with them. Get them spay/neutered and vaccinated and look after them. It is a very fulfilling experience. Last but not the least I would like to say – a dog is a beautiful gift of God to humanity. They enrich your life with their selfless love and devotion and make your life beautiful. It is a crime and a sin to abuse their faith in you so indulge in a pet only if you are ready to do justice by him. (Tandrali Kuli started volunteering with Friendicoes when she was in college nine years back and now she is part of the management and mainly looks after the PR/Communications and Adoptions. She always had dogs since she was four years old and till now she has been the proud pet parent of 19 dogs (desis/Pedigrees mix) and have fostered over 30 of them). http://www.dogsandpupsmagazine.com/wp-content/uploads/2017/05/1254nal.jpg 0 0 Dogs and pups Magazine http://www.dogsandpupsmagazine.com/wp-content/uploads/2017/05/1254nal.jpg Dogs and pups Magazine2012-07-20 16:29:482014-02-07 17:47:30Don't abandon me please! “The one absolutely unselfish friend that man can have in this selfish world, the one that never deserts him, the one that never proves ungrateful or treacherous, is his dog… He will kiss the hand that has no food to offer; he will lick the wounds and sores that come in encounter with the roughness of the world…When all other friends desert, he remains,” -George G Vest. Then, why does man desert this precious being… sometimes due to behavioural issues, sometimes because he is sick and sometimes just the frenzy of keeping a pet is over. It’s just a bad dream, I told myself. Gazing at the sunset sky today. Abandonment: a curse for poochesWe get one or two cases a month of abandoned Pedigree dogs. Three of the main reasons for their abandonment include pet parent’s spouse hates dogs; pets are not house-trained; and death of the pet parent. It is difficult to re-home pedigree dogs as many abandoned pets do not have proper training, sometimes they develop behavioural problems and do not adjust in new pet parents’ houses.This can be reduced by creating mass awareness and putting-up posters on or near pet-shops. Besides, following factors should be kept in mind before adopting a dog: adopt an Indian dog as he is best suited for the climate, all family members must agree to adopt a dog. Besides, the family should have all information on the breed they are adopting, the dog should be trained properly and in a humane way. And most importantly, remember that the Pet is a Living Thing. Remember, A Dog Is For Life ! Not For Christmas! (Nilesh Bhanage is currently working with Worldwide Veterinary Service (WVS), UK as India National Rabies Network Manager in management category. He supports Paws on an honorary basis). Responsibility. If you are in a job where you do not have quality time for your pet then you should not invest in one. No servant, however good, can equate to the care you can and should give to your pet. Your pet also has emotional needs apart from food and vet care and he looks to you to fulfill them. Tandrali: Pedigree adults still have a 50 percent chance of getting re-homed with a good family. But the younger, the better. The ones above five years old hardly get any responses. We currently have nine of them at the shelter – three GSDs and six Labs between 7-9 years. The smaller breeds get adopted quicker (except for Spitz) but they are rarely abandoned until and unless they are sick or are bad biters. Compared to it, abandoned Indian/desi adults are almost impossible to re-home. Almost 99 percent of them make their way to our sanctuary in Gurgaon as we do not get any inquiries for them. http://www.dogsandpupsmagazine.com/wp-content/uploads/2012/07/Don’t-abandon-me-please-2.jpg 160 300 Dogs and pups Magazine http://www.dogsandpupsmagazine.com/wp-content/uploads/2017/05/1254nal.jpg Dogs and pups Magazine2012-07-16 07:04:412014-02-07 17:47:30Don’t abandon me please! After four years of successful service in Delhi, JBF (India) Trust expanded its work to Guwahati, Assam in the year 2007. Main endeavour of the organisation in this North East Indian city was to provide humane service to all homeless and community animals through veterinary care, humane education and awareness. The organisation has been carrying out mass activities for rabies and population management under the banner ‘Humane Dog and Rabies Management Program’. “I am associated with JBF since its inception as my husband Dr Sashanka being the founder member and managing trustee of this organisation. In fact, JBF is a brainchild of Dr Sashanka and we are still trying our best and nurturing it to let it grow and develop more and more. We really have struggled and crossed a lot of hurdles to reach where we are today and still a long way to go ahead…,” told Dr Smriti. Main projects and animal welfare programmes taken up by JBF include: Mobile Veterinary Clinic Services, Rescue and Rehabilitation of Homeless Animals, Animal Birth Control and Anti-Rabies Vaccination (ABC-AR) Program under ‘Humane Dog and Rabies Management Program’, Awareness and Sensitisation Program, Training and Advocacy Program and Disaster Relief. Dr Smriti who is veterinarian (surgery and radiology) from the College of Veterinary Science, Khanapara, Assam said that her husband Dr Sashanka has been her strength and driving force that keep going and doing animal welfare. She also mentioned that animal welfare is her profession and passion too! There is no specific number of animals in the centre, except the post-operative animals; rest just comes in to get treated and then released to their locations. JBF’s next landmark plan for the year 2012-13 is to set-up a Humane Rescue, Education, Training and Research Centre – ‘Nurture Animal to Universe Relation in Environment (NATURE)’ in Guwahati. This would be the organisation’s new asset, increasing the space available and also to help imparting humane education to the society. Dedicating their achievements to all helping JBF to provide welfare of the animals, Dr Smriti put her last but not the least humane words seeking your support to march on and on.